With the upcoming release 0.4.0 of Eclipse NeoSCADA™, the IEC 60870-5-105 implementation will finally make its way back into NeoSCADA. This will allow me to finally release the IEC 60870 component Apache Camel to Maven Central. The Camel components for IEC 60870 are based on the NeoSCADA implementation and provide both client and server side of the protocol. Although the implementation of IEC 60870 does not implement all message types defined, all relevant types for data transmission and control are implementation and other modules can be added by an extensible mechanism, using the core layers of the protocol. For Camel there are two endpoint types iec60870-server and iec60870-client. These allow either to offer data as IEC 60870 or to actively request data from another 60870 server. The client component will open a connection to the remote station and initiate the data transmission. 60780 will then send updates for all addresses but the Camel component will only forward events to connected endpoints. When the connection breaks, it will be periodically tried to re-establish the connection. All event coming from the IEC connection can of course be processed with Camel. For the server side the Camel component will hold an intern data model which can be filled using the Camel routes. 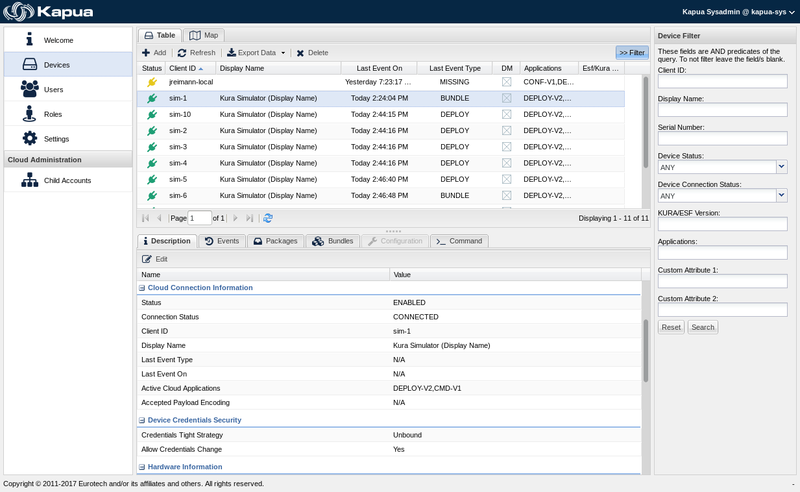 In internal state will then be published to IEC clients connecting to the server instance. It also allows the use of background transmission or batching of events when required. Now what can you actually do with IEC 60870 and Apache Camel? Well, to be honest, if you never have heard about IEC 60870 and don’t have a proper use case or specific requirement for it, then you should probably look for something different to play with 😉 IEC 60870 is used to remotely control and monitor electrical systems and power control systems (see Wikipedia page about IEC 60870-5). On the other hand, if you do want to use 60870, then the Apache Camel component can make it pretty easy to provide a data over the IEC protocol or get data out of an 60870 based system. 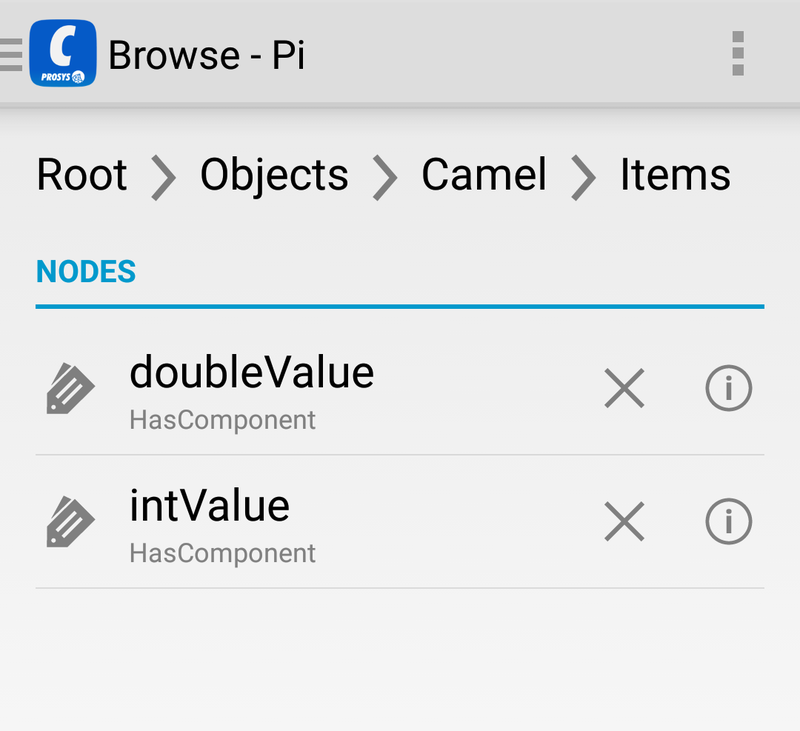 As routing data with Camel is easy, you can for example create a very simple Mock device in a Raspberry Pi for testing your system with an IEC component. And you can do all of this with pure open source (EPL licensed) software. You can also extract data out of your application and offer it towards another system, which explicitly requires a transmission based on IEC 60870. When the component will be released on the next few weeks I will hopefully find the time to provide some example, showing what you can do with IEC 60870 and Apache Camel. This means that there is now a released version of, available on Maven Central as well, of the Apache Camel Milo component which can either be used standalone or dropped in directly to some OSGi container like Apache Karaf. 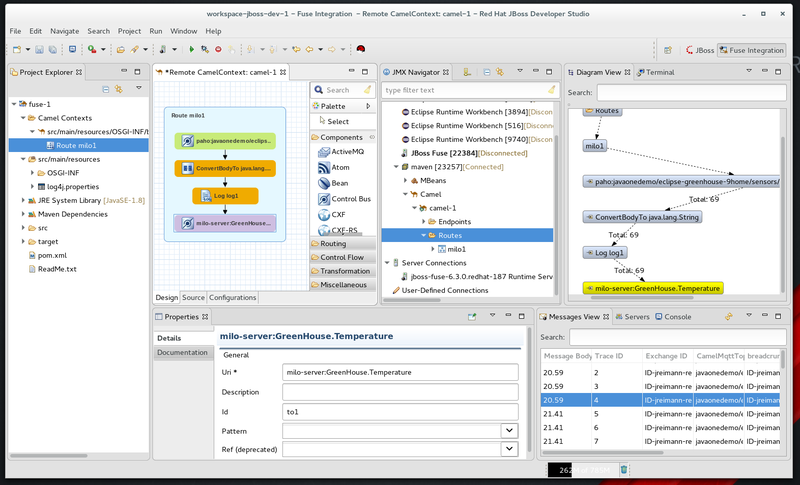 This will compile and run a simple example which transfers all temperate measurements from the iot.eclipse.org MQTT server from the topic javaonedemo/eclipse-greenhouse-9home/sensors/temperature to the OPC UA tag item-GreenHouse.Temperature, namespace urn:org:apache:camel on the connection opc.tcp://localhost:12685. This configures a Camel Milo server component and routes the data from MQTT to OPC UA. 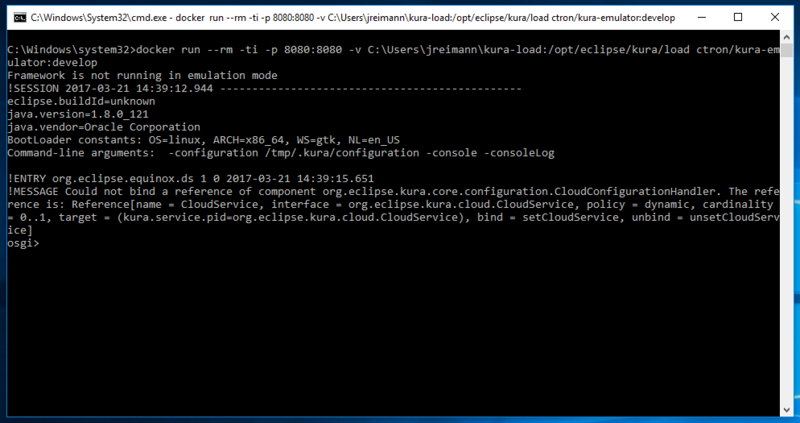 I also did update the Kura Addon for Milo, which provides the Milo Camel component for Eclipse Kura 2.1.0 which was recently released. This component is now also available on Maven Central and can easily be deployed into Kura. See the Kura Addons page for more information. Then there are a few location where I used SNAPSHOT versions of Milo and for some I did promise an update. So I will try to update as many locations as I can with links to the released version of those components. To be honest, I had my troubles in the past with the Eclipse Communication Framework (ECF), not that it is a bad framework, but whatever I started it was complicated and never really worked for me. This story is different! But having a decent IDE integration would also be awesome. So when Scott Lewis from the ECF project contacted me about that, I was ready to give it a try. Unfortunately the whole setup required more than Kura could handle at that time. But now we do have support for Java 8 in Kura and there also is some basic support for running Kura on Karaf, including a docker image with the Kura emulator running on Karaf. We are mapping all network to the host instance, since we are using another port, which is not configured in the upstream Dockerfile. There is probably another way, but this is just a quick example. You should already see some information about that target device now. But when you open a new view (as before) named Karaf Features you will also have the ability to tinker around with the Karaf installation. The upcoming version 2.1.0 of Eclipse Kura™ will feature an enhanced version of the Apache Camel™ integration which was introduced in Kura 2.0.0. There are various new ways on how to run Camel routes, configured either by XML routes or using the Java DSL. Apache Camel can act as a Kura application but, new in this release, there is also a way to simply configure Camel as a “cloud service”. In past releases of Kura, applications could only push data to one cloud target. The new 2.1.0 release will add the functionality of adding multiple cloud targets and one of those targets can be Apache Camel router instances. With Camel you can have different ways of achieving this goal, but in this post I would like to focus on the “out of the box” way, by simply configuring (not developing) a set of Camel routes, which act as cloud service. Traditional instances of cloud services in Kura are only capable of delivering data to one cloud target or subscribing to one cloud infrastructure. But using Apache Camel as a technology it is possible to connect to a bunch of technologies at the same time. 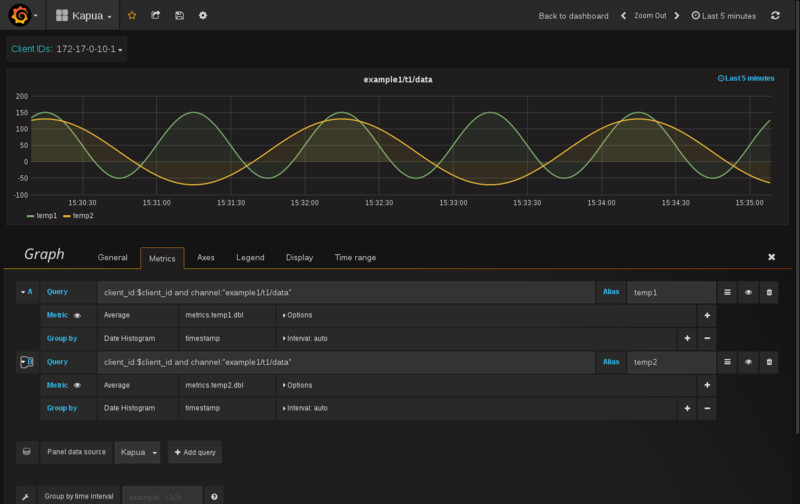 The setup will be a Kura instance, running a pre-release version of Kura 2.1.0. The final version should be out in a few weeks and won’t differ much from the current version. We will be configuring a new cloud service instance which takes Kura application payload data and provide it as OPC UA, using the Camel OPC UA adapter. As payload provider (aka Kura application) we will be using the “Example publisher” from my Kura addons project. Note: As an alternative you can also download the “dp” package with your desktop browser and deploy the file using the “file” upload instead of “URL”. The installation may take a bit and it may be necessary to press the “Refresh” button in order to see the installed package. After the packages was installed you should be able to see the service “Camel example publisher” on the left side. This installation will take a lot longer and you will need to check again by pressing the “Refresh” button in the Web UI. We will also need to allow TCP access to port 12685. If you have the network managed version of Kura installed switch to the UI section “Firewall” and open a new port “12685” allowing access from “0.0.0.0/0” (Permitted Network) and press “Apply”. 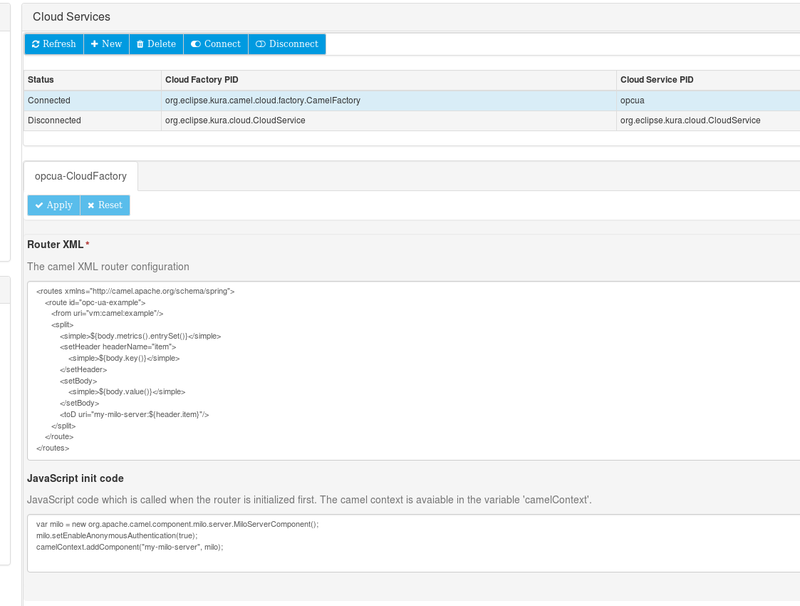 By default the “example publisher” will publish to the default Kura cloud service instance. We will now create a new Cloud service instance and then redirect the data to OPC UA. The data will be available as an OPC UA server. 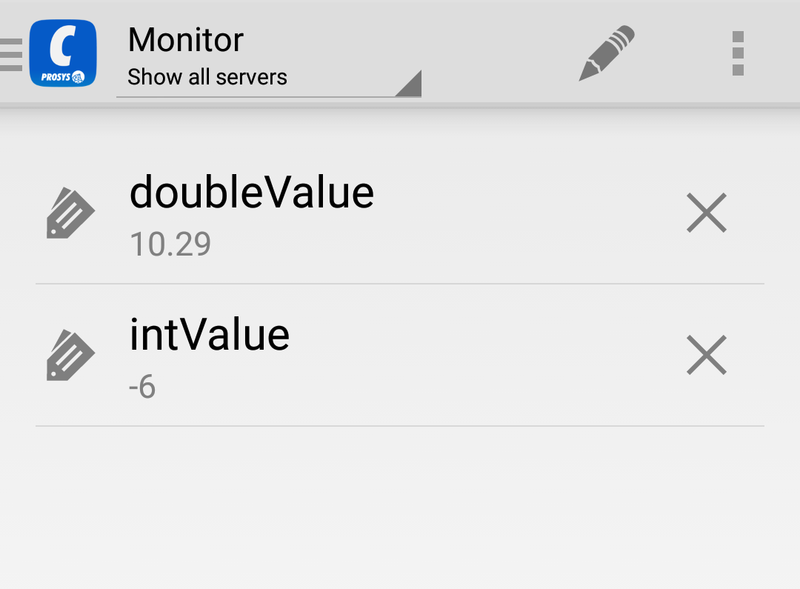 OPC UA differs between client and server. And while the Camel component does provide both ways, in this case we want others to consume our data, so offering data as an OPC UA server is the way to go. Navigate to “Cloud Services” and press the “New” button. From the list of possible providers select org.eclipse.kura.camel.cloud.factory.CamelFactory, enter a cloud service PID (e.g. camel-opcua) and press “Create”. Now we need to configure the example publisher to actually use our new cloud service instance. Select “Camel example publisher” from the left navigation bar and enter “opcua” (or whatever PID you used before) as “Cloud Service PID”. Apply the changes. 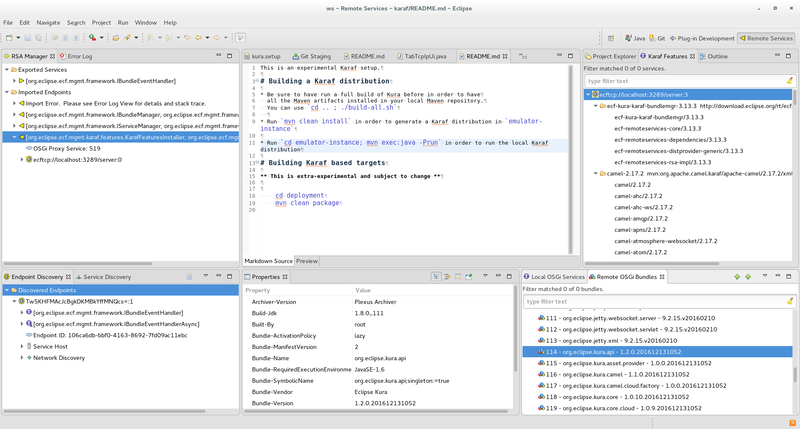 This tutorial uses a SNAPSHOT version of Eclipse Milo. Simply due to the fact that no version of Milo is released just yet. This should change in the following weeks and my play is to update the blog post once it is available. However the functionality of Milo will not change and using the Camel component, most internals of Milo are hidden anyway. Update: As Milo and the Camel Milo component are released now I did update the links. Apache Camel on Eclipse Kura can provide a complete new way of communication. This example was a rather simple one, Camel can do a lot more when it comes to processing data. And not all real-life applications may be as easy as that. But of course the intention of this blog post was to give a quick introduction into Camel and Kura in combination. Using the Camel Java DSL or the Kura Camel programmatic API can give greater flexibility. And yet, the example shows that even with a few lines of Camel XML, amazing things can be achieved. Sometimes the simple things may be the most valuable. 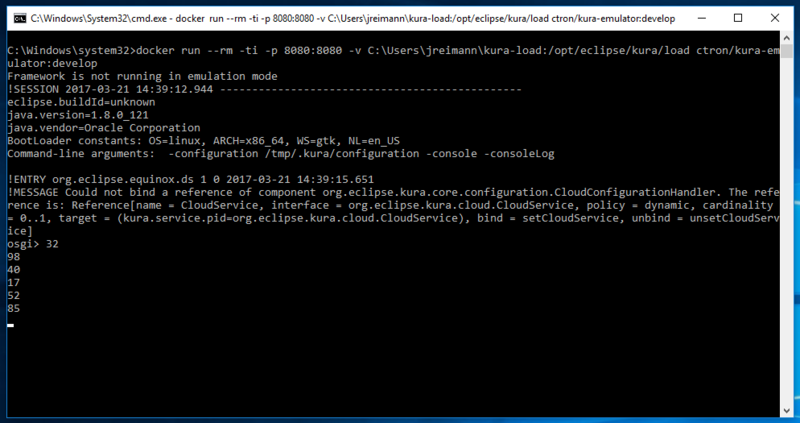 Testing with Eclipse Kura™ on a Raspberry Pi (or any other Eclipse Kura device) may be a bit tricky. Of course can use the Eclipse UI in combination with mToolkit. But if you want to edit, compile, deploy from a local desktop machine, to a Kura device, then you either need to click through the Web UI for uploading your application. 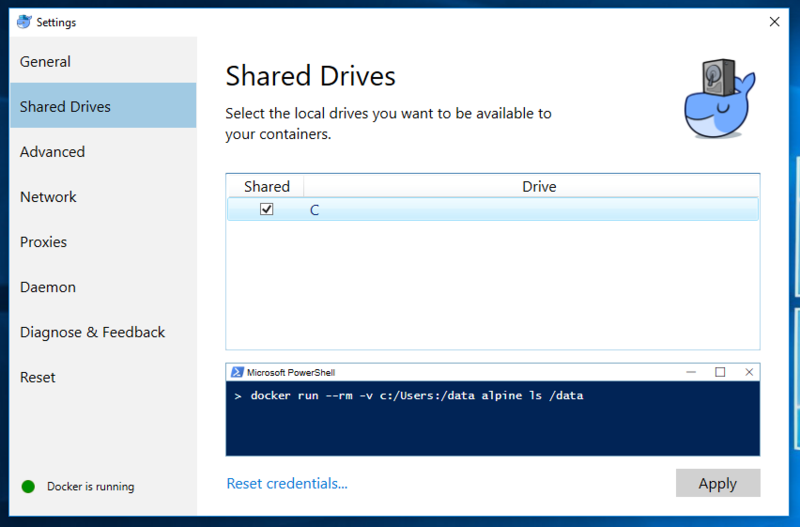 But for this to work you also need to assembly a DP (distribution package). But what if you could simply drop an OSGi bundle into a directory and let it get picked up by Kura automatically. Thanks to Apache File Install, there already is such a solution. File Install scans a folder and loads every OSGi bundle located in this folder. If a bundle is started and it gets overwritten in the file system, then File Install will reload and restart the bundle. So deploying and re-deploying to a Kura device is as easy a copying a file to your target with SCP (or the remote copy tool of your choice). And installing Apache File Install into Eclipe Kura now just got a bit simpler. After confirming using the Submit button it will take a bit and then File Install will be installed into your Kura installation. Sometimes it takes as bit longer than Kura expects and you need to reload the Web UI (Ctrl-R) until Kura has performed the installation. Dragging this button into the Kura Web UI will bring up a confirmation dialog if you want to install the addon. After confirming it will go and fetch the DP and install Apache File Install into the running Kura instance. Now once this initial activate has been performed, File Install and OSGi will keep the bundle active. You can re-deploy this OSGi bundle by simply copying a new version over the old one. File Install will detect the change and refresh the bundle. Apache File Install can also update OSGi configurations and it can be configured using a set of system properties. For the full set of options check out the Apache File Install documentation.